Psidium guajava, the common guava, yellae guava, or lemon guava (kent as goiaba in Portuguese an guayaba in Spaingie) is an evergreen shrub or smaw tree native tae the Caribbean, Central Americae an Sooth Americae. It is easily pollinatit bi insects; in cultur, mainly bi the common honey bee, Apis mellifera. 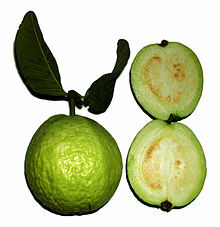 ↑ 1.0 1.1 1.2 1.3 "Psidium guajava". Germplasm Resources Information Network. USDA. October 17, 1995. Retrieved February 6, 2009. This page wis last eeditit on 12 Apryle 2017, at 17:13.